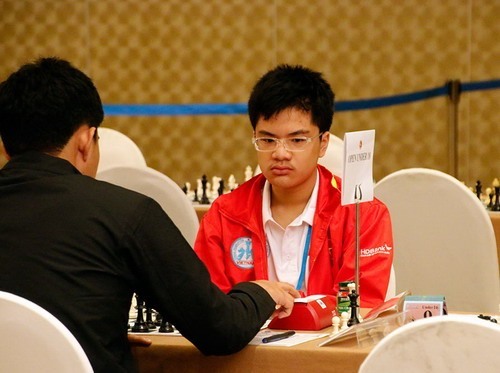 HÀ NỘI — Vietnamese young talent Nguyễn Anh Khôi, 17, finished 15th at the 2019 Sharjah Masters International Chess Championship in the UAE on Sunday morning. International Master Khôi lost to Grandmaster Alireza Firouzja of Iran in the last round of the event to gain six points after nine rounds. With this result, Khôi finished 15th out of 150 players from around the world. In the penultimate round, Khôi beat his compatriot, Grandmaster Lê Quang Liêm after 45 moves. Earlier, Khôi and Liêm faced off at the HDBank International Chess Tournament 2017, in which Khôi was defeated by Liêm. Khôi was former world champion in the U10 and U12 category. Meanwhile, Liêm finished 20th with six points. In the last match, Liêm beat Sadhwani Raunak of India but the win wasn’t enough for Liêm to climb to the top 10. Inarkiev Ernesto of Russia won the event with seven points, followed by Wang Hao of China and Ukrainian Kryvoruchko Yuriy. The Sharjah Masters attracted the participation of 150 chess players from 30 countries and territories, playing according to the nine-round Swiss system.